We had perfect weather in Virginia this weekend. 75*, sunny, a light breeze. The kind of weather that makes you believe that Spring may finally be here, that leads to lovely outdoor runs and white wine on the deck. The same weather that in years past has caused you to put your cold-sensitive plants outside because "they'd like a little sunshine" only to have them frozen by a freak late-March storm (not this year my friends...I won't be fooled again.) 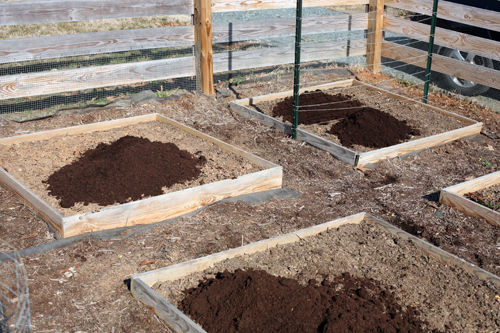 It was the kind of weather that got me thinking about our vegetable garden, and how the time for sowing seeds is just around the corner and I still hadn't amended the beds with fresh compost. It was perfect weather for wandering around the local garden center, picking up spring-harvest seeds and dreaming about how, if only I had my own cold-frame set up in the backyard, I could already have baby lettuce peeking out of the soil. Hmm...maybe next year. This will be our third year with the garden, and over the last two we've started to sort out which veggies work and which don't. There were disappointments last year...the Virginia heat was too much for the brussels sprouts to handle and the squirrels got 75% of the corn. We unearthed the secret to keeping flea bugs off of the eggplant and had an abundant harvest, only to discover that there are really only two eggplant recipes that we like and the farmer's market can more than provide the fruit needed for those. No need to take up valuable garden space. 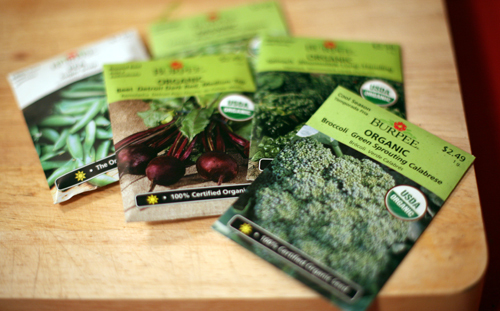 On Saturday I bought lettuce and spinach, beets, peas and broccoli, all seeds that can go in the ground in the next couple of weeks and provide a harvest in as few as 45 days. In May, after danger of Virginia frost, I'll be sowing green beans and okra seeds to be harvested in July. Baby tomato, cucumber, bell pepper and squash plants will go into their assigned beds and parsley, basil and dill will join the perennial chives, thyme and oregano already starting to show some green. I think I am most looking forward to growing our own broccoli, although each veggie has a special place in my heart and becomes my instant favorite the minute it is ripe. But broccoli...it gave us trouble last year, or at least the squash bugs that enjoyed most of the harvest gave us trouble. And I enjoy a challenge. We will persevere with broccoli this spring and when we do we will make it this way, at least once. There are a few things about this recipe that I need to share, things I will do differently when I make it again. First, I used whole coriander but will definitely use ground next time. Biting into the occasional coriander seed was an intense, unpleasant experience for me. If you love coriander feel free to use whole seeds, but I think spreading the flavor more evenly by using ground would be more enjoyable. Second, the tofu needs to go in the oven first. 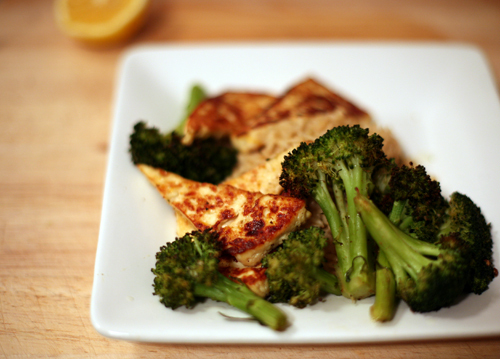 I put the tofu and broccoli in at 425* together, and the broccoli was done well before the tofu. To speed things up I wound up removing the tofu from the oven and quickly pan-frying it, but I think it would be really good roasted. I've specified in the recipe below to put the tofu in first and roast it until golden brown on one side before flipping it and adding the broccoli for the last 20 minutes. 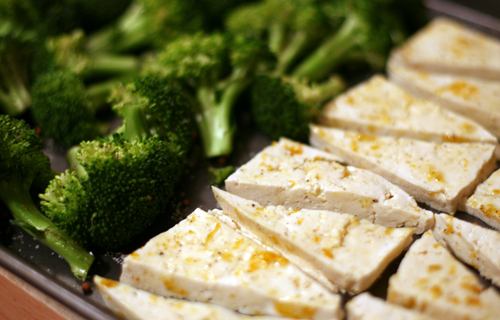 Slice tofu into eight 1/2" slices, then slice again on the diagonal to make 16 pieces total. Place on paper towels and press for 10 minutes. 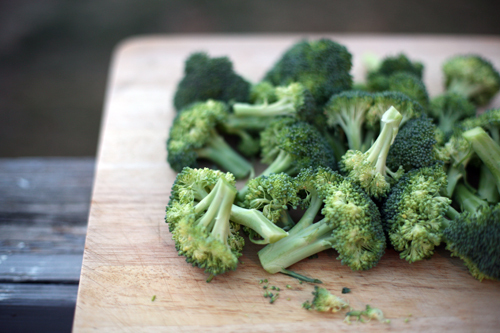 In a large bowl, toss broccoli with 2 tablespoons oil, coriander, cumin, 1 teaspoon salt, 1/2 teaspoon pepper and chili powder. In a separate bowl combine remaining 2 tablespoons oil, lemon zest, honey, remaining 1/2 teaspoon salt and remaining 1/2 teaspoon pepper, and whisk together. 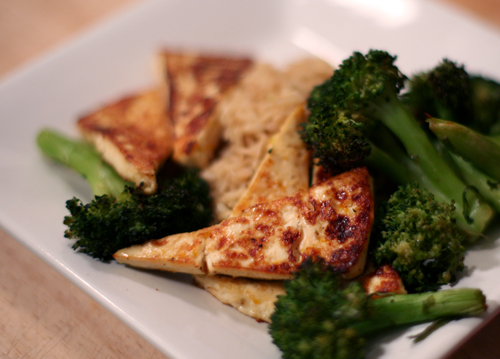 Individually rub each piece of tofu with the oil/lemon/honey mixture. Place on a baking sheet and bake until top is golden brown. Pull baking sheet from oven and flip tofu. 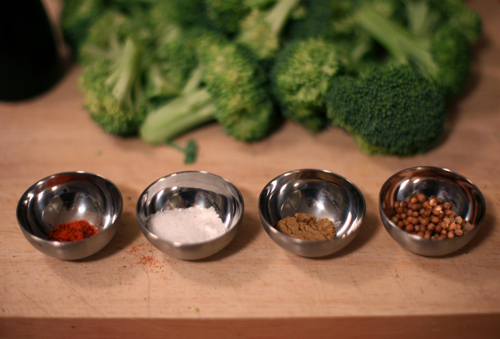 Add broccoli to baking sheet, spreading in a single layer. Put pan back in oven and roast for 10 additional minutes. Stir broccoli and roast for another 10 minutes. Serve over rice, with fresh-squeezed lemon juice. First, my cousin Kelly (Meghann's sister) was in a scary accident this evening while riding her bike. Thankfully she was wearing a helmet and is going to be ok. I'll let Meghann give us details if she wishes, but I do want to stress how important it is to wear a helmet. Kelly's may very well have saved her life. Second, I'm going to make bella terra posts a regular occurrence, to share with you all the happenings in the garden and recipes to go along with harvests. I don't yet know the frequency, but I hope that by this summer they will be weekly. I'd love any feedback you have or suggestions for content. What would you like to see? Third, thank you all for your continued support! I'm so pleased with the feedback I've received regarding the new format and am so happy that you all seem to be open to whatever direction I go. I will say that I've enjoyed my week of recipe-based posts and would like to continue with them, although I wouldn't be surprised if a food diary post pops up every once in awhile. I just can't help but to take pictures of my daily food, and I still have overwhelming urges to share them with you. So I think that I'm not going to set any rules, not limit the blog in any way. I'm going to let the day and life and food inspire me and see where it goes, and I hope you'll all continue to follow.